With 83% of proteins coming from real meat like chicken, turkey and cod, your cat will be sure to get the amino acids they need to build strong muscles and bounce back from a day of play. Our top four ingredients are animal protein sources. Compare to the brand you’re feeding your athlete! Deboned Chicken, Chicken Meal, Turkey Meal, Deboned Cod, Whole Peas, Lentils, Chicken Fat (preserved with Mixed Tocopherols & Citric Acid), Pea Fiber, Natural Chicken Flavor, Ground Flaxseed, Dried Chicory Root, Dried Kelp, Dried Sweet Potato, Dried Cranberries, Calcium Carbonate, DL Methionine, Taurine, Zinc Proteinate, Choline Chloride, Vitamin E Supplement, L-Ascorbyl-2-Polyphosphate (source of Vitamin C), Iron Proteinate, Niacin Supplement, Copper Proteinate, Thiamine Mononitrate, Calcium Pantothenate, Vitamin A Supplement, Manganese Proteinate, Pyridoxine Hydrochloride, Sodium Selenite, Riboflavin Supplement, Dried Bacillus coagulans Fermentation Product, Yucca Schidigera Extract, Vitamin B12 Supplement, Calcium Iodate, Folic Acid, Rosemary Extract. 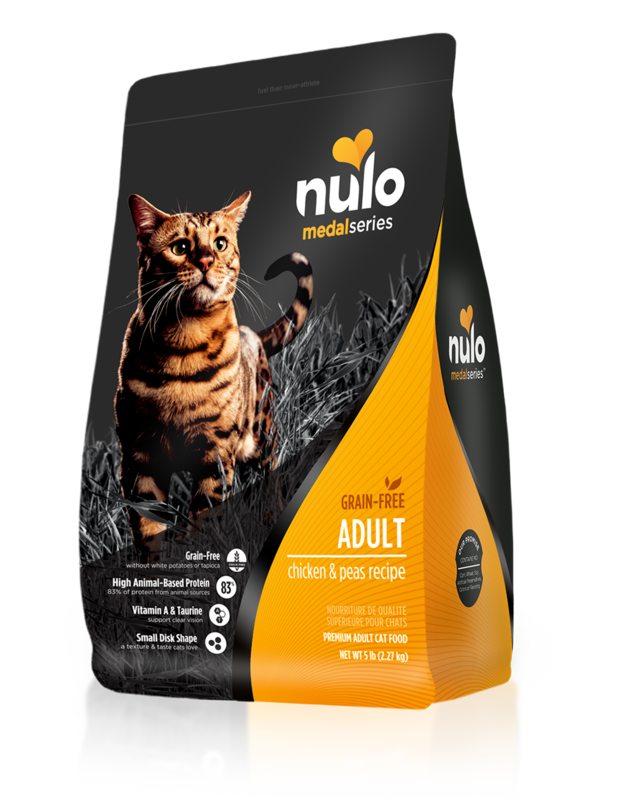 MedalSeries Adult Cat Chicken & Peas Recipe is formulated to meet the nutritional levels established by the AAFCO Cat Food Nutrient Profiles for all lifestages.